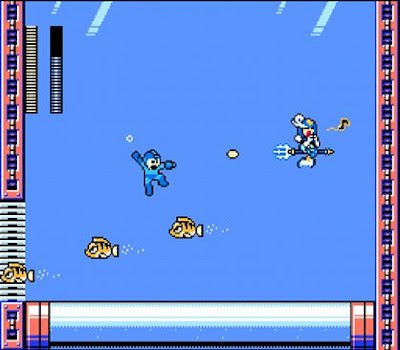 Ever since Capcom announced it was making Mega Man 9 in the retro graphic style of the series’s earlier installments on the Nintendo Entertainment Systems — in case you’re counting, that’s four systems generations previous to the Wii —information has lowly been leaking out, giving people like me some clue as to what this pseudo-flashback will actually play like. As I’ve said before on this blog, included in the pre-release buzz is the decision to make one of the game’s bosses female. The presence of this gynoid-among-androids simultaneously is and isn’t a big deal. For what it’s worth, she’s an assemblage of pixels and therefore lacking in true gender. 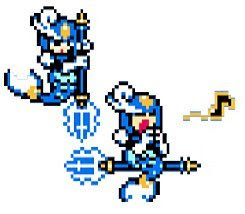 Beyond that, her pixels are assembled into a robot formation, meaning that even if video game characters could have gender, this one doesn’t. On the other hand, it means something to lifer gamers that a series that has previously pitted Mega Man against set after set of all-male Robot Master bosses finally admitted that a ladybot could give Mega Man just as hard of a time. (A few blogs have even noted that Capcom had initially planned to include two Robot Mistresses, but scaled that plan down in order to make Mega Man 9 seem like not too great a departure. Capcom released her concept art this week. It’s below, and when you see what’s attached to the lower half of her body (robobody) you’ll see why I was compelled to write about this. And here she is as she will appear in the actual game. 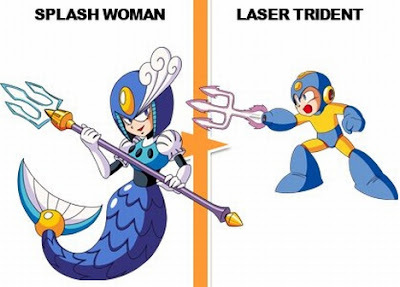 On the right of the concept art, you see that the weapon Mega Man gets upon defeating Splash Woman is her electrified trident. I’m thankful it wasn’t, like, a gun that shoots hearts or something, but the fact that the “Laser Trident” is basically three electrified phalluses is a little amusing. So let’s see: a record first of a woman doing something that only men had previously done, she enjoys wielding a phallus weapon, she has a distinct fashion sense, and she’s pure evil. Is Splash Woman Sarah Palin? You call SplashWoman a "gynoid-among-androids." Aren't androids, y'know, androgynous? It's usually not held to; Data has frequently revered to himself as an android and admitted that he's "fully functional," though Threepio is a bit of a fop. What's the masculine name for an autonomous humanoid robot? As I understand it, android comes from the Greek root andro, which means "human" but also "man," in the sense that mankind including all men and women. Inclusive though it might be, there's an inherent bias in favor of the masculine, as the name Andrew, which is related to andro, can mean "a man" and "manly." And androgynous etymologically means "male and female," even though it gets used today often to mean "lacking any gender" rather than "having both genders." In order to specify that a robot was a lady robot, someone at some point coined the word gynoid, using the root gyno, as in gynecologist. So just like women could be part of mankind, a gynoid is still an android, really, just a certain kind of one. So to answer your question, the masculine form is android, dumbly.